I recently had the privilege of working with Hy-Vee, a grocery store chain based in the Midwest. What an amazing, customer-focused operation. Visit their stores and you will be impressed with their amazing employees and their excellent service. After my speech to the store directors, I met one of Hy-Vee’s executive vice presidents. He was very proud, and deservedly so, about how they use social media to enhance their customer service. 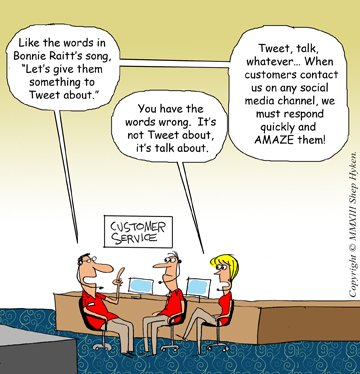 He shared a story, which is an excellent example of how any company can use social media to take care of the customer. By the way, this is an example of reactive customer service. A customer complained and the company executed the reaction perfectly. A customer was standing in the checkout line and Tweeted: Whenever I come go to Hy-Vee’s Chinese Express Department, they are always out of what I want. Mad! Hy-Vee has something they call the Listening Room. This is where employees monitor – or should I say listen to – their customers sharing comments on various social media channels: Facebook, Twitter, etc. Reaction time in the Listening Room is important. The employee who was “listening” immediately tweeted back to the customer to step out of line and wait in Aisle One. Within moments the manager found the customer, introduced himself and was able to get the customer what he wanted. The story ends on a positive note when the customer, who had a short wait in line to check out, Tweeted that he loves Hy-Vee and how they took great care of them. Your customers will talk about you, potentially broadcasting their experiences, good and bad, to the world using social media channels. Don’t fight it. Embrace it. Companies need to monitor, or as Hy-Vee says, “listen to,” these social media channels for any customer comments. If the comments are negative, act quickly. Response time is one of the keys to a successful resolution. Great companies respond within a few minutes. In the Hy-Vee story, it was literally a few seconds after reading the Tweet. Very impressive! Companies need to resolve negative issues quickly; the faster the better – and more impressive. A positive outcome to a negative situation can ideally end with the customer going back to their social channel of choice and broadcasting a complementary statement that turns into positive PR for the company.